Children tend to get sick in the evenings or on the weekends as we parents all know too well. 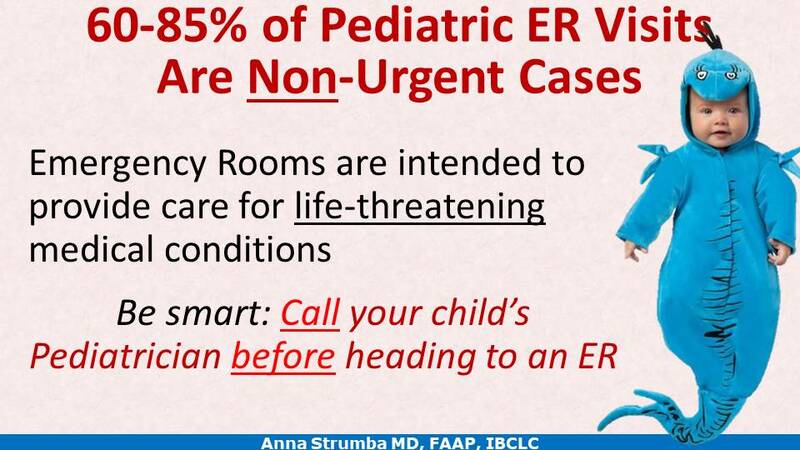 Before heading to an ER or urgent care, please speak to your primary care pediatrician on-call to get the best advice. In many cases the advice will be to bring your child for a sick visit next morning, instead of going to the ER or urgent care straight away. Emergency rooms are intended to save lives and provide care for life-threatening medical conditions. Using ER for non-urgent cases is simply wasteful: not only it wastes your own time and money, it also contributes to inefficiencies, overcrowding and adverse effects in an already taxed healthcare system. West Bloomfield Pediatrics is open for walk-in urgent care visits at both Novi and West Bloomfield locations every Monday morning from 8:30 till 9:30 am, no appointment is needed. We also are open every Saturday morning for same-day sick visits. Anna Strumba MD, FAAP, IBCLC is a Board certified pediatrician in Novi, Fellow of the American Academy of Pediatrics, and an internationally certified lactation consultant. Disclaimer: No medical advice, diagnosis or treatment on this site; not even if you are a current patient of Dr. Strumba. See Terms and Conditions.